If you are concerned about limited access to the Chincoteague National Wildlife Refuge and the Assateague National Seashore, let your voice be heard! Click here to see how you can make your comments. 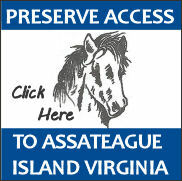 This web page is intended to facilitate community awareness and involvement in regards to future access and usage of Assateague Island, Virginia. It is our hope that not only the local community get involved, but also the thousands of visitors that love Chincoteague Island. There is strength in numbers. Chincoteague needs YOU to help make a difference! At the bottom of this web page you will find a list of contacts. Please let your voice be heard! Time is of the essence. We do not have much time to voice our opinions. NOTE: This is not an official Town of Chincoteague web page. This web page is sponsored by Chincoteague.com. The goal of the this web page is to keep the public informed about the ongoing planning process by the NPS and FWS which will eventually affect public use and access of Assateague Island, Virginia. The U.S. Fish & Wildlife Service (FWS) and National Park Service (NPS) share management of Assateague Island. They are each working on separate plans that will effect Assateague Island usage and access by the public. The NPS plan is called a "General Management Plan" (GMP). The FWS plan is called a "Comprehensive Conservation Plan" (CCP). In August 2011, both the FWS and NPS released their preliminary plans. It should be noted that these plans are preliminary drafts and the finalized plans are set to be released next year. Both the draft GMP and the draft CCP include four alternatives for public use and access to Assateague Island. Click here to download the FWS draft Comprehensive Conservation Plan (CCP). Click here to download the NPS draft General Management Plan (GMP). Note: The FWS CCP will have the most impact for public usage and access on the Virginia side of Assateague Island, as the FWS has the most control over the Virginia portion of Assateague Island. The NPS GMP includes new closures and regulations that will impact local watermen. The GMP closures and regulations would be implemented within a 1/2 mile boundary around Assateague Island, waters historically controlled and regulated by the state of Virginia. Many in the community, especially local business owners, are very concerned that many aspects of these new plans will be detrimental to the community of Chincoteague. Chincoteague's tourism industry, which relies on beach access and the wild ponies, will be especially vulnerable under the proposed FWS CCP. Note: Assateague Island, Virginia is the only public beach access from the Maryland side of Assateague Island to Virginia Beach, Virginia. This is approximately 100 miles of coastline. The FWS owns most, if not all, of the barrier Islands south of Assateague Island, all the way to mouth of the Chesapeake Bay. All of this land is closed to the public and is set aside soley for bird habitat and other wildlife. The residents of Chincoteague Island simply want to maintain our existing recreational beach, which is approximately 8.5 acres of beach parking lots and off road vehicle access. Negative Aspects Of The Proposed FWS "Comprehensive Conservation Plan"
Each of the four alternatives within the overall FWS CCP are different. From our study of the FWS draft CCP, it is our opinion that the following would have a negative impact Chincoteague Island. Elimination or reduction of beach parking (currently 961 parking spaces). During the peak summer season, 961 parking spaces is not enough. We need more beach parking, not less. A survey conducted by the Town of Chincoteague showed the majority of visitors do not want to ride a bus to the beach. Requiring beach goers to park off site (Chincoteague) and ride a shuttle bus to the beach. This would be logistically impractical, especially during frequent summer thunderstorms. It would make it too easy for the FWS to transition to shuttle busses only (no beach parking), which we believe is their ultimate goal. Purchasing an off site location (Chincoteague campground) from which to stage off site parking and shuttle bus. It would be extremely expensive, 7 million dollars. Reducing the size of the Pony herd on Assateague (current herd size is already limited to 150 ponies). If the herd size is reduced, their grazing areas would be reduced accordingly, limiting their visibility to the public. Denying or limiting local watermen's access to Tom's Cove to harvest oysters and clams. Eliminating or limiting Off Road Vehicle (ORV) usage on the beach. Elimination of horse riding on the beach. No recreational or commercial fishing within a yet to be defined "Marine Sanctuary" somewhere in the Chincoteague Bay. Elimination of the National Park Services Tom's Cove Visitors Center. Note: The above list was compiled from our reading of the various alternatives within the FWS draft CCP. They do not all neccesarily come from any one alternative. However, we do not yet know which alternative the FWS will choose. They could combine aspects of the various alternatives into a final plan. It is our opinion that there are many negative aspects to each of the four alternatives within the FWS draft CCP. We feel that any of the proposed changes listed above would reduce the recreational experience of Assateague Island. A reduced recreational experience would leave Chincoteague less able to compete with nearby beach towns. This would lead to a reduced tax base, reduced real estate values, and an overall degradation of the community. JUST THE THREAT OF THESE PROPOSALS BECOMING REATLITY IS CAUSING STRESS FOR MANY IN THE COMMUNITY. Click here to read the October 2011 Beach Access Newsletter from the Town of Chincoteague. Click Here to read the Town of Chincoteague's official response to the Fish & Wildlife Service CCP, submitted October 3, 2011. Click Here to read the Town's official response to the proposed NPS GMP, submitted on September 9, 2011. The letter outlines aspects of the proposed NPS GMP that the Town 'Strongly Oppose', aspects that the Town 'Support', and also requests addtional information in certain areas. Click Here to read a letter from Chincoteague Mayor Jack Tarr to Refuge Manager Lou Hinds, on December 7, 2010. Mayor Tarr's letter outlines the Town of Chincoteague's official input during the public scoping phase of the FWS CCP process. The following was released on Thursday September 1, 2011 by Mrs. Donna Mason (Waterside Inn), head of the (non-government) Beach Access Committee. Minimum of 961 parking spaces. NO Reduction in size of the Pony Herds current 125-150. Oppose any Alternative that abandons the public trust. Oppose the purchase of property for Off Site Parking. Oppose elimination of oyster and clam ground leases. Oppose elimination of ORV access. Oppose further loss of freedom of access. In 2010 the Town of Chincoteague conducted a 'beach access' survey of visitors to Chincoteague Island. The town collected over 2,400 responses that represent over 11,500 people. The questionnaire was widely distributed through emails, our business community, civic organizations, and online. Click here to view the results of the beach access survey. 9/18/2012: The Town of Chincoteague's Beach Access Committee releases August 2012 newsletter. Click here to view the newsletter. 9/18/2012: The US Fish & Wildlife Service Draft CCP for the Chincoteague National Wildlife Refuge is set to be released in December 2012. 8/27/2012: The US Fish & Wildlife Service releases "Chincoteague National Wildlife Refuge Comprehensive Conservation Planning (CCP) Newsletter August 2012". Click here to view the newsletter. 7/10/2012: Thanks to public pressure the US Fish & Wildlife Service is revising plans for future access to Assateague Island. The revised plans are to be released to the public in the fall. Your continued influence it greatly needed! Click here to see how you can make your comments. 10/16/2011: Click here to read the October 2011 Beach Access Newsletter from the Town of Chincoteague. 10/16/2011: On October 3, 2011 the Town of Chincoteague submitted their official response to the Fish & Wildlife Service. Click Here to read the Town's official response to the FWS CCP. 10/16/2011: Click here to read a letter from the Eastern Shore Tourism Commission. 9/27/2011: Click Here to view Part 1 of the WAVY TV10 story. Part 1 is focused on new restrictions that would effect local watermen. 9/25/2011: WAVY TV10 has completed interviews with our area watermen and focused on the National Park Service General Management Plan newsletter options that impact regulation of the waters surrounding Assateague Island. It should be on Monday September 26th in 2 parts at 5pm and 6pm. 9/21/2011: Click here to read a letter from the Chincoteague Island Charter Boat Association. 9/20/2011: On 9/15/2011 the Town of Chincoteague released to the public the official Town response to the NPS GMP. Click here to read the Town's response. 9/20/2011: In 2010 the Town of Chincoteague conducted a 'beach access' survey of visitors to Chincoteague Island. The town collected over 2,400 responses that represent over 11,500 people. The questionnaire was widely distributed through emails, our business community, civic organizations, and online. Click here to view the results of the beach access survey. 9/15/2011: Listen to two very excellent interviews by our local radio station WCTG. One with Chincoteague Mayor Jack Tarr and one with local watermen Eric Wimer. We strongly encourage everyone to listen to these interviews! You will learn a lot about what's happening and what's at stake!! Click Here to go to the WCTG web site and listen to the interviews. Help spread the word. Place the above banner on your web site and add a link to this web site. Right click on the image above and select "Save Image As" to get a copy of the image. The deadline for comments to the National Park Service is October 1, 2011. The deadline for comments to the Fish and Wildlife Service is October 31, 2011. Scroll down to the 'What You Can Do To Help' section to find out how you can voice your opinion! Click Here to watch the video "Piping Mad". Click here to watch other short video clips from "We The People" of the Outer Banks of North Carolina. "Several years ago when asked whether he had any public uses that were incompatible with wildlife, he produced a list longer than that by any other refuge. It included wildlife observation, photography, hiking, cycling, birding, mosquito control, and commercial fishing." "Hinds and his staff were determined to solve the compatibility issues through regulation, and they are doing so. Although they complained, crabbers are no longer allowed to enter the impoundments." "Buses and mopeds were eliminated from Wildlife Drive, and all traffic is prohibited on Fridays." "This is a sensitive habitat, and the ponies are a feral species." "In the short term, the herd is sustainable, but that is without taking into consideration any change in the habitat." The FWS draft CCP includes reducing the herd size of Chincoteague Ponies on Assateague. Wild Ponies have inhabited Assateague Island for hundreds of years (long before the FWS came to Assateague). If you are concerned about limited access to the Chincoteague National Wildlife Refuge and the Assateague National Seashore, let your voice be heard! Contact the FWS, the NPS, and your local elected officials. Copy the following email list and paste it on the "To" line of your email. Put "Chincoteague NWR" as the subject. Express your comments and concerns in the body of the email. Next, go to the following online email forms and directly input your comments. More contact information is provided below. Its our Assateague Island. Together "We The People" can make a difference!